Have you ever blamed your bad situation on fate? Something such as the stars not being aligned or your parents not giving you the correct genes? It is often easier to shift the blame to some happenstance rather than taking the onus on ourselves. For some of us, we are constantly looking over our shoulders waiting for the next bubble to burst. With it goes our social status, our finances, or even our health. We become anxious about what may come tomorrow, and then we become resigned to the lot we are dealt, knowing it was our fate all along. As Thoreau says, the majority of us live with this quiet desperation. We roll with the current and idly let it lead us to whatever destination is ahead. Why would we do this? Because it is the easier path, one that keeps us within our comfort zone. But this comfort zone is a fantasy that will prevent us from ever finding true happiness. So instead we are content to float down the lazy river quietly until we meet our final destination. I have come to a point in my life where my quiet desperation has become very loud in my mind. Maybe it is a mid-life crisis of realization that I have fallen well off the path I was hoping to go. I looked at all the markers of where I wanted to be (body, soul, and spirit) and did not like what I saw. My desperation began to grow knowing that time on this earth is limited, and my end is on the horizon. No longer could I be resigned to mediocrity, and so I had to begin the process of changing. A process that I hope will never end. 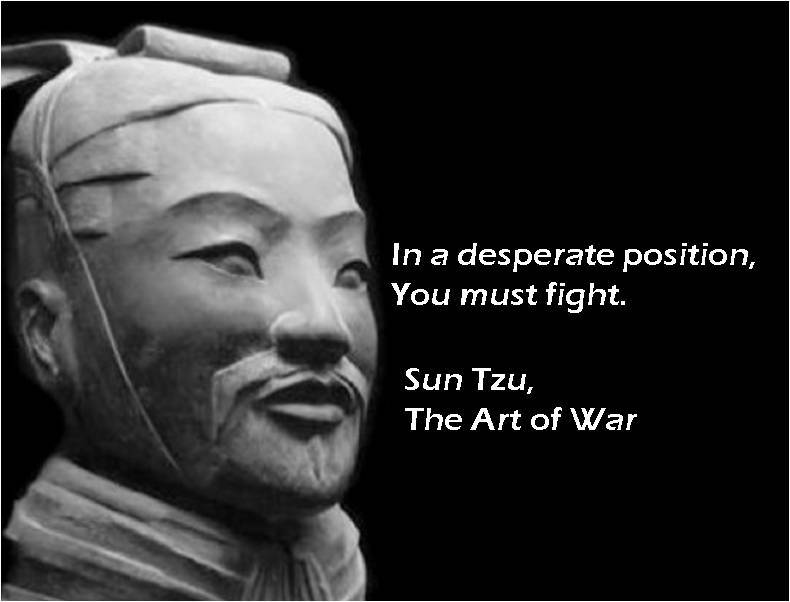 When I first read Sun Tzu, I never understood why you wouldn’t cut off all chances for the enemy to escape. I thought the goal was total victory. But for the surrounding army in the dominant position fighting a surrounded enemy is dangerous and very costly. Why? What happens to an enemy that has no chance to escape? They don’t usually become resigned to their fate and just fall upon their swords. No, they become desperate, and “in a desperate position, you must fight.” They fight even harder for the families they may never see again and for the comrades that stand in the ranks next to them. Life all of a sudden becomes very precious, and they hold it most dear. Being in a desperate situation is not ideal, but there are positives that can be had from the situation. Desperate people committed to winning don’t give up. They find a way out. Oftentimes it is an unconventional way, one that has you swimming against the current to survive. But when life is precious and you realize that time is running out, you find not only a way to survive but a way to be victorious. Thanks for reading Ron. Though difficult, these hard times make us better humans and keep us humble along the way. As long as we keep fighting, there will always be hope.